" RGR: relative growth rate = g increase in plant weight g_1 plant weight d_1. 6 NAR: net assimilation rate = g increase in plant weight dm-2 leaf area d_1. c LAR: leaf area ratio = cm2 leaf area g_1 plant weight. d SLA: specific leaf area = cm2 leaf area g_1 leaf weight. ' LWR: leaf weight ratio = g leaf weight g_1 plant weight. 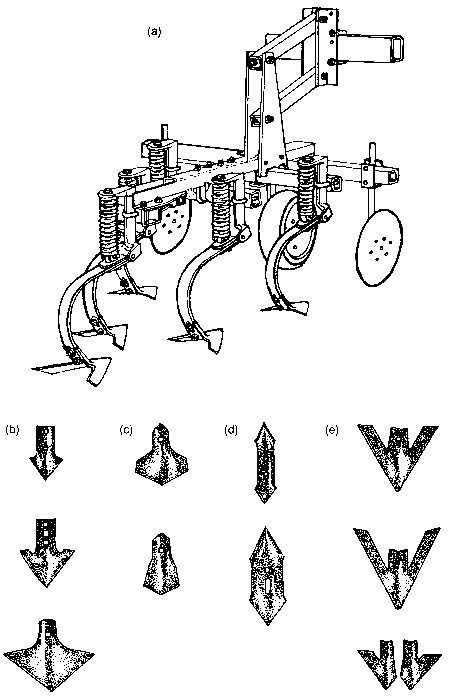 s RWR: root weight ratio = g root weight g_1 plant weight. g Average of root diameters at 0,7,14,21, and 28 days after emergence. h RLI: relative rate of root length increase from 0 to 28 days after emergence. Therefore, the crop's absolute growth rate is initially greater, and usually remains greater for at least several weeks (Dunan & Zimdahl, 1991; Tanji, Zimdahl & Westra, 1997). Use of the initial advantage conferred to the crop by relatively large size and high absolute growth rate is a key concept in ecological weed management (Mohler, 1996). A major strategy in most annual crops is to design the cropping system so that the initial size advantage still holds at the time the crop and weeds grow into physical contact. With few exceptions, both crops and weeds are adapted to open habitats, and both are intolerant of shade (Blackman & Black, 1959; Knake, 1972; Loomis & Connor, 1992, pp. 274-5; McLachlan et al., 1993; Bello, Owen & Hatterman-Valenti, 1995). Consequently, if the crop is in the superior position, it will suppress the growth of the weeds, whereas if the weeds grow above the crop canopy, then yield reduction is likely to be severe. Which outcome occurs depends on (i) the relative timing of emergence, (ii) the time course of height growth for the two species, and (iii) how rapidly the crop canopy closes. Factors that can be manipulated to affect the relative timing of emergence include planting date (Chapters 4 and 6), cultivation (Chapter 4), and mulch (Chapter 5). 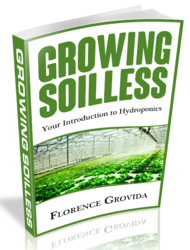 Factors that can be manipulated to affect the growth of crops relative to weeds include the planting date (Chapter 6), the use of allelopathic materials (Chapter 5), and the timing, type, and spatial distribution of fertilizer and irrigation water applied to the crop-weed community (Chapter 5). Finally, the speed with which the crop canopy closes can be increased through narrow row spacing, dense planting, intercropping, use of fast-growing cultivars, and choice of planting dates that optimize crop growth rate (Chapters 6 and 7). The effectiveness of these tactics depends on the morphology of the weed species present in the field. For example, a tall, erect weed species is unlikely to be suppressed by a low-growing crop unless the emergence of the weed is substantially delayed relative to the crop. To some extent, weeds change shape in response to shade. For many broadleaf species, including Polygonum arenastrum (P. aviculare), Cassia (Senna) obtusifolia, Abutilón theophrasti, and Xanthium strumar-ium, branch length is reduced when the plant is shaded or crowded by competitors (Geber, 1989; Regnier & Stoller, 1989; Regnier & Harrison, 1993; Smith & Jordan, 1993). Shade or crowding also inhibits release of lateral buds in some species, particularly on the lower parts of the main shoot (Abutilon theophrasti, Datura stramonium but not Xanthium strumarium - Regnier & Stoller, 1989; Amaranthus retroflexus - McLachlan et al., 1993 ). These changes presumably channel resources into height growth rather than lateral spread and thereby improve competition for light. Several studies on Amaranthus retroflexus have shown that the vertical distribution of biomass and leaf area shifts upward as competition increases (Légère & Schreiber, 1989; McLachlan et al., 1993; Knezevic & Horak, 1998). Differences in branching of C. obtusifolia emerging on different dates and located at various distances from the soybean row allowed that species to maintain a nearly constant proportion of leaves above the crop, regardless of the timing of competition (Smith & Jordan, 1993). Since morphological flexibility allows some weed species to overtop even competitive crops like soybean, either the tactics discussed above need to create a substantial size differential between the crop and weed or else tall weeds will need to be dealt with by other means. Plants compete for nutrients and water as well as for light. This is apparent from the many studies in which perennial cover crops growing beneath a main crop reduced yield less in a wet year or when irrigated, even though the cover crop was kept short (Chapter 7) (Mohler, 1995; Teasdale, 1998). Similarly, a short weed like Taraxacum officinale can reduce yield of a tall crop like sweet corn in a dry year (Mohler, 1991), even though shading by the crop reduces transpiration by the weed. In annual cropping systems, the soil is unoccupied by roots at the beginning of the season, and usually nutrients and water are relatively abundant. Under such conditions, the outcome of below-ground competition between the crop and weed depends primarily on the rate at which the two species occupy the soil with roots, and their relative rates of uptake. Andrews & Newman (1970) showed that root density is critical in competition for nutrients. Because small-seeded species tend to have a higher rate of root elongation (Table 2.7) (Seibert & Pearce, 1993), weeds tend to rapidly occupy the soil volume to the detriment of the crop. Probably because weeds are adapted to exploit the brief pulse of nutrient availability that follows disturbance, they also usually have substantially higher macronutrient concentrations in the shoot than do the crops with which they compete (Vengris et al., 1953; Alkamper, 1976; Qasem, 1992). They thus sequester nutrients that would otherwise be available to the crop. Given that weeds have this double competitive advantage, fertilization often favors weeds more than crops (Chapter 5) (Vengris, Colby & Drake, 1955; Alkamper, 1976; Lawson & Wiseman, 1979; Dyck & Liebman, 1994). Consequently, directing water and nutrients toward the crop rather than the weeds is a critical component of weed management. This can be achieved by fertilizing and irrigating directly in the crop rooting zone, timing the application of fertilizer or manure to correspond to the needs of the crop, and using organic materials that inhibit root growth of weeds (Chapter 5). Below-ground competition works differently in perennial systems where the soil is permanently occupied with roots (Grubb, 1994). In perennial communities, the competitive dominant is usually the species that can deplete the limiting resource to the lowest level (Tilman, 1982). Thus, in unfertilized grasslands, the superior competitor is usually the species that reduces the nutrient element in shortest supply (often nitrogen) to the lowest concentration when the several species are grown in monoculture (Tilman & Wedin, 1991a, 1991b). However, the ability to compete on low-nutrient soils is usually associated with a low ability to adjust growth rate in response to resource availability (Lambers & Poorter, 1992). Consequently, when grassland is fertilized, large, fast-growing species tend to overtop and shade out species adapted to low-nutrient conditions (Smith, Elston & Bunting, 1971). Since fast-growing species grown under favorable conditions tend to have higher concentrations of nitrogen (protein), minerals, and water, and lower concentrations of secondary compounds than slow-growing species (Lambers & Poorter, 1992), their palatability is high. That is, the potentially fast-growing species tend to be desirable forage species (i.e., the "crop"). Thus, fertilizing a weedy grassland tends to have the opposite effect on the competitive balance between crops and weeds of fertilizing a weedy annual crop. However, legumes complicate this picture somewhat. In low-nitrogen soils, nitrogen-fixing legumes tend to have an advantage relative to other species (Donald, 1961), despite relatively slow growth (Grime & Hunt, 1975). Where legumes have been abundant for a while, however, nitrogen accumulates, and taller-growing grasses tend to displace them (Turkington & Harper, 1979). Dung deposition also favors tall-growing grasses that displace legumes and contributes to a shifting mosaic of species in pasture communities (Lieth, 1960). Weed management in pastures is discussed further in Chapter 9.